How to play Amiga SWOS 96/97 or 16/17 on your Mac? If this preconfigured App for Mac OSX does not work, please install it yourself with links below. If it still does not run at full speed, check out Crossover for MAC! I don't find an opponent!! What can I do?? 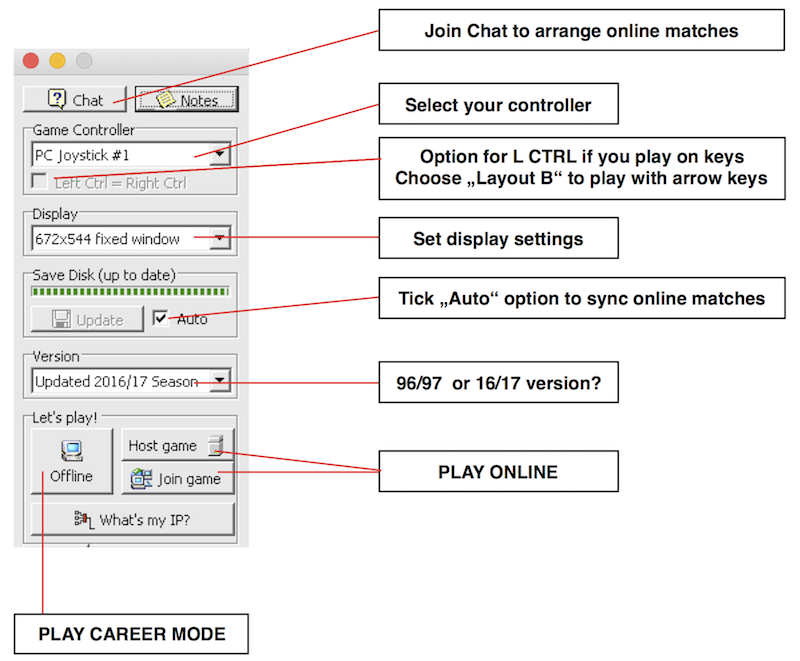 CLICK HERE to join the match chatroom!! Do NOT leave after 1 minute if nobody answers. Be patient and give people time to answer! yes app works fine but for me only in 672x544 fixed window mode, fullscreen always flash, other stretchable window mode doesn't work (black screen). Hey thanks! I have reuploaded a new version, with some more graphic details for Wine, including directx etc... Can you redownload and test again? I tried, but nothing changed... and furthermore if i select 16/17 database start with original database, i don't know why. Ok, thanks for your feedback! I will try to fix it. The aswis on the 16/17 works almost perfect for me.. only weird thing is that it has an empty save disk on offline, is the correct? online i can play with tactics, so that works.. great work red hair and the rest.. now i can finally join asl! The aswis on the 16/17 works almost perfect for me.. only weird thing is that it has an empty save disk on offline, is the correct? Sure, offline disc works separately, so your saved career games won't be overwritten upon save disc update for online play! If you want to use custom tactics, duplicate the online save disc and rename it accordingly to match offline save disc's name. That's it. Also, thanks for your feedback. Glad it works. You wrote "almost" perfect. What can be improved? Try now, with 800x600 fullscreen setting! Should work fine. This, i very much needed! Thank you for sharing, i basically had no idea where to start. I tried this one on my Macbook. The problem is when I start it, I do not know how the Keyboard Layouts A, B, C work. Since I only have a left CTRL on my Macbook and it seems none of my keys gets me further with Keyboard Layout C.
Arrow keys + left CTRL! Thanks, that works. Just wondering if there is a way to remap the keys? Or explain to me what the other options are? Because the arrow keys on my Macbook are quite small. Another thing, the suggested 800x600 fullscreen doesn't work in Offline mode. I just get the 672 x 544 version. Also all strechable modes are not working and fullscreen also doesn't. I downloaded it today. Only working in 672 x 544 fixed window, all other modes aren't working. Just wondering if there is a way to remap the keys? Not quite correct! It should work, if you setup the wine package yourself, on your Mac! For this preconfigured one, I was just aiming for compatibility with all Mac settings.